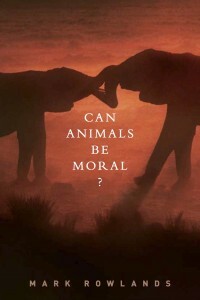 Centre Fellow Professor Mark Rowlands’ new book Can Animals be Moral? has aroused discussion about the moral capacities of animals. In Can Animals be Moral?, Professor Rowlands examines the reasoning of philosophers and scientists on this question–ranging from Aristotle and Kant to Hume and Darwin–and reveals that their arguments fall far short of compelling. The basic argument against moral behavior in animals is that humans have capabilities that animals lack. We can reflect on our motivations, formulate abstract principles that allow that allow us to judge right from wrong. For an actor to be moral, he or she must be able scrutinize their motivations and actions. No animal can do these things–no animal is moral. Professor Rowlands naturally agrees that humans possess a moral consciousness that no animal can rival, but he argues that it is not necessary for an individual to have the ability to reflect on his or her motives to be moral. Animals can’t do all that we can do, but they can act on the basis of some moral reasons–basic moral reasons involving concern for others. And when they do this, they are doing just what we do when we act on the basis of these reasons: They are acting morally. The topic is highlighted in an exchange between Professor Rowlands and Professor Grace Clements in the forthcoming issue of the Journal of Animal Ethics, see here, and a selection of responses can be found on Professor Rowlands’ blog here.